For the wearer of this lotus flower, a symbol of renewal and enlightenment, inspiration is always blooming. Each night, lotus flowers descend into the muddy river waters of Vietnam and India. Every morning, they emerge from the mud unstained, and bloom again with pure white petals. 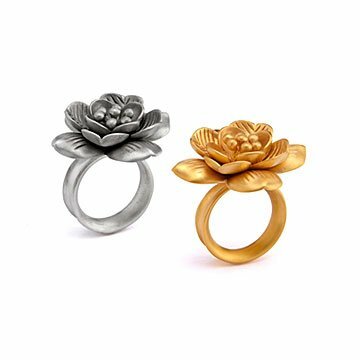 Satya Scainetti's hand-forged blossom ring reminds its wearer that people, too, bloom in unpromising-seeming circumstances. The lotus flower has symbolized purity, enlightenment, self-regeneration and rebirth for thousands of years, from ancient Egypt to modern India. Wearing this blossom will remind yogis, Buddhist believers, and flower fans that each day is an opportunity to flourish afresh. Adjustable, in sterling or 14k gold plate. Handmade in Thailand.